Historic ship in 'Perfect Storm' heading to the scrap heap? The USS Zuni/USCGC Tamaroa, circa 1947-48. The only surviving Navy ship from the invasion of Iwo Jima that was later transformed into the Coast Guard rescue cutter depicted in the movie “The Perfect Storm” is on the verge of being scrapped, according to maritime history buffs trying to save the vessel. The Zuni Maritime Foundation in Virginia has been looking to raise $500,000 to put the 205-foot ship in dry dock so that its hull can be repaired, but fundraising efforts have fallen short. The vessel was bought by an unnamed benefactor in 1994 who had hoped to restore the ship and turn it into a museum. 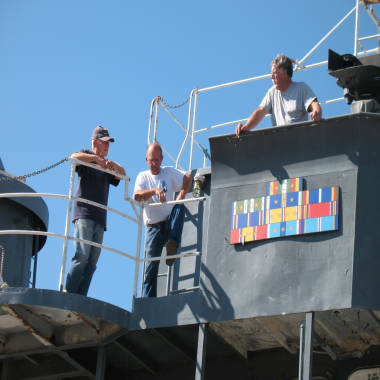 Since then, a dedicated volunteer crew of former Navy sailors and Coast Guard members has restored the vessel’s interior and much of its exterior. But after leaks in the hull this spring the Coast Guard deemed it a hazard to navigation, meaning it can't be moved. Ownership of the vessel is now being transferred to the head of a salvage yard, foundation officials told NBCNews.com. The new owner, Tim Mullane, of the American Marine Group salvage operation in Norfolk, Va., has allowed the ship to be temporarily moored at his dock but has said fixing the ship’s hull may well cost twice the $500,000 goal of the foundation. It remains unclear how long the historic vessel will be allowed to be moored at American Marine. "It’s hearbreaking," Tom Robinson, foundation director, told NBCNews.com. "Ten years of effort down the drain. The ship is ready to be scrapped." However, Harry Jaeger, operations chief for the foundation, told NBCNews.com he hasn’t given up hope. Volunteers aboard the USS Zuni/USCGC Tamaroa in Virginia. Jaeger, who has spent countless volunteer hours leading the restoration of the ship and just came back from Vallejo, Calif., to obtain World War II vintage pilot house controls for it, said Mullane has shown a personal interest in preserving the ship and even led efforts to plug the leak that threatened to sink it. "We’re trying to be optimistic when the new owner takes over," Jaeger said. "But business is business." 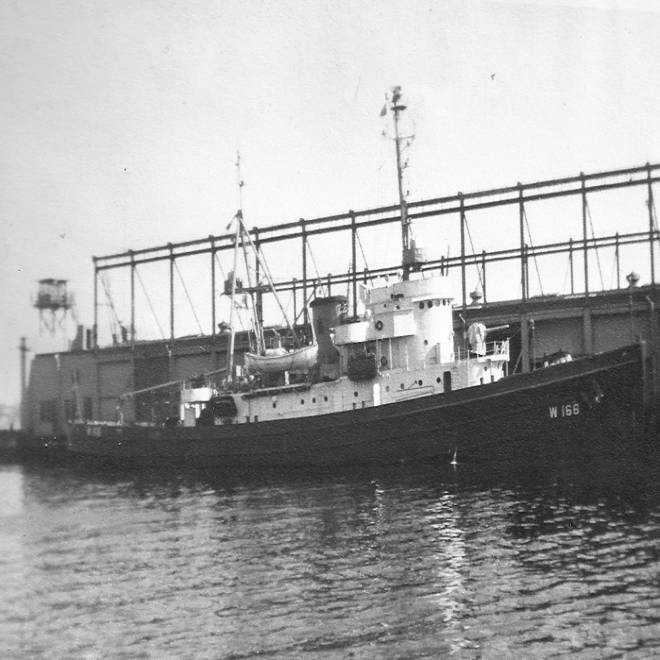 The ship was known as the Zuni when it earned four battle stars for World War II service as an ocean salvage tug. "It rescued sailors at Iwo Jima and saved ships damaged by torpedoes," Jaeger said. The Zuni was decommissioned by the Navy after the war in 1946, transferred to the Coast Guard and renamed the Tamaroa, the name of a fierce Native American tribe. The “Tam” was home-ported at Staten Island and Governors Island, N.Y., from 1946-1985 before being moved to New Castle, N.H.
As a Coast Guard cutter, the ship carried rescuers on a daring mission in 1991 to aid three people from the sailboat Satori in 40-foot seas and 80-knot winds some 75 miles off Nantucket island during what was known as the “No Name Storm of Halloween,” according to a Coast Guard history of the ship. Ten minutes after that ordeal was finished, the Tamaroa was called to save Air National Guard crewmen whose plane was downed during a rescue of their own. That rescue earned the cutter and crew a commendation. Author Sebastian Junger chronicled the drama of that day in his book “The Perfect Storm,” which later became a movie of the same name starring George Clooney and Mark Wahlberg. The nonprofit Zuni Maritime Foundation, located in Richmond, Va., had hoped to turn the ship into a museum and tourist attraction that would teach visitors the history of the 69-year-old vessel. It had also expected to make the vessel available to Sea Cadets, Sea Scout and other groups of young sailors.